On Friday I wrote the post The Silence Of The Blogs (And Industry Analysts). Pierre I am happy to say is not alone, as Buyers Meeting Point’s Kelly Barner also answered the proverbial bell, offering her own unique perspective on what is now known as #CodeGate. Jon, you are on the right side of this issue, and I appreciate your willingness to fight for what is right. At SpendMatters, we haven’t made friends at groups like SAP, AT Kearney, CIPS, and others for speaking out on certain issues, but sometimes you just need to do the right thing and say what needs to be said. In this case, if you have a non-profit (and a non-profit representing purchasing organizations!) that developed a data standard that gets transferred to a for-profit firm, and both groups aggressively protect that single standard (with the same name as the non-profit!) and advocate its use in the Institute’s community, This [effectively] creates a monopoly and it does indeed seem to create a fundamental conflict of interest (and violation with the spirit of the mentioned code of ethics). If I was a government acquisitions entity, and a member of an association like this with such a code of ethics, I would basically need to NOT use this code because of the fact that doing so would in fact violate that code of ethics. I would also express my displeasure to my association for in fact creating this embarrassing situation in the first place. I won’t dive into the particulars of this situation since you are doing this actively, but all I can say is that, by definition, you can’t have a true standard that is owned by a single commercial entity, and if you do, you would want to at least be comfortable that the owner is willing to offer it up because doing so will bring good brand recognition and respect. For example, even Ariba (SAP) offers up cXML as a standard that everyone can use if they want (whether they want to is a different story). On the flip side, there was a catalog vendor named Requisite Technology that wanted to patent its catalog schema called “Requisite Unified Schema” and offer it up as an industry standard. Guess what – it died on the vine. However, things like RosettaNet (developed by High-Tech industry players) and UN/SPSC are all now managed by GS1.org – not a commercial entity. UN/SPSC is a great example actually. It came out of D&B, but D&B isn’t trying to sue everyone using it – or even ‘cross-walking’ to it! Rather, you are free to use it, but can join the paid membership at various levels to be able to have a say in its future development. Here is the site: http://www.unspsc.org/membership. Nobody says that non-profits can’t make money, but they have to do it the right way. It’s fine for a non-profit association to advocate for standards and to even develop standards, but they must be open. The non-profit can also have commercial partners. For example, you could have partners who offer training, data conversion services, hosted catalogs, etc. BUT, you have make the partnership opportunities open to all. You can’t be a market maker and a market supplier at the same time – especially as a procurement association! In a free market, these type of problems are almost always ‘self-correcting’, and I hope this will be the case here. But a truly free market is one that is transparent, and I applaud you for bringing some transparency to this issue, and hopefully the message will be embraced by the NIGP members who are really the only ones who have the power AND the inclination to change this obviously bad situation. Keep fighting the good fight. What I hope from this is that the public sector agencies that use NIGP realize that they can be the beneficiaries of the free market. 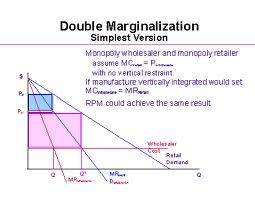 There are qualified alternatives to NIGP should they choose to make a change. Enough other groups have looked the downsides of the switch in the face and made the decision to move away from NIGP anyway. ‘Standards’ have a way of feeling inevitable – even when they are not mandated standards. The next period of time in the public sector could prove quite illuminating. Will the agencies using NIGP confirm the worst stereotype of public procurement by staying the course regardless of these troubling developments, or will they surprise us by rising up and saying ‘enough,’ either collectively or individually and gradually over time? As more comments from industry bloggers and analysts come in, I will post them. In the meantime, and as this story continues to build momentum and likely garner similar sentiments from those in the industry at large, will the NIGP members to which Pierre referred do something? Will the agencies using the NIGP (and NIGP code) stand up to what is clearly an attempt to monopolize the public sector per Kelly’s statement? 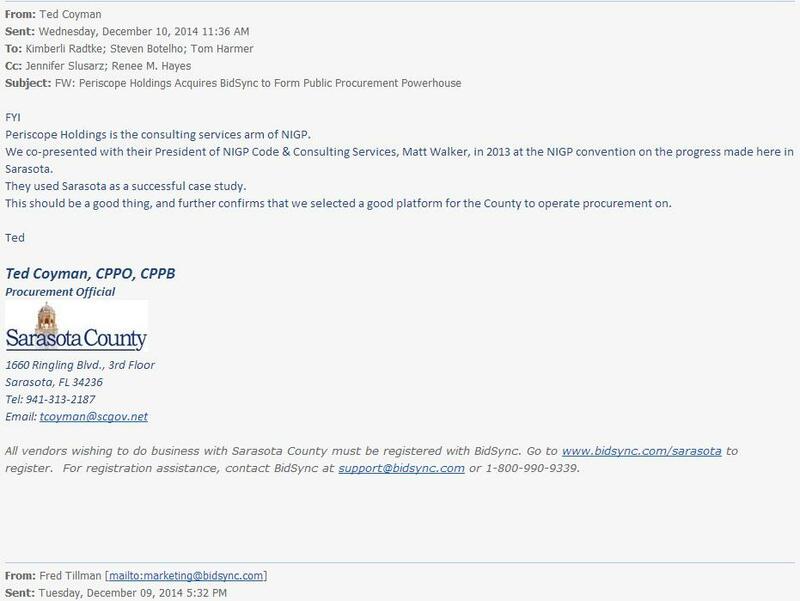 One thing is certain, if I were a procurement official such as Ted Coyman in Sarasota County, I would think twice about the sentiments I had expressed in a December 10th, 2014 e-mail to colleagues regarding the Periscope acquisition of BidSync being a good thing, and focus on what it really means to public sector procurement. A good thing . . . for whom? Editor’s Note: Criticism of the NIGP and it’s dealings with Periscope relating to the stewardship of the NIGP Code growing. Read why in this post from Procurement Insights North America. The above is a quote from the “Partnership for Public Procurement” website, a joint effort between NIGP and CIPS. Although the partnership was announced in 2011, very little seems to have come of it since then. Intended to be a research and standards-setting effort, the primary output seems to have been a series of short, instructional white papers. The sad thing about what seems to be happening here is that ‘fair and ethical treatment’ are not being carried out, much to the detriment of the overall integrity of the process and everyone who relies on NIGP’s standards. I think of CIPS as being an institution with exceptionally high standards. They are another group that has incentive to want the real story behind Periscope and NIGP to come to light. Thank you for the additional information Kelly. I know that the Procurement Insights EU Edition Editor Colin Cram – who is quite familiar with CIPS – will likely have something to add in terms of this discussion. Regarding the white papers co-produced by NIGP and CIPs, these are done by the members and so are pretty well free from the ‘politics’ of either organisation. They should continue. What is surprising to me Colin – and thank you for weighing in on this side of the pond – is that this went on for so long. I believe that while the NIGP in 2001 missed the obvious conflict when a month before acquiring Simonton (the Code’s previous steward), Periscope registered the name BuySpeed, it is beyond me how they could have also misinterpreted the Parthenon-led control recapitalization of Periscope and the subsequent merger with BidSync as anything but an attempt to leverage the Code’s stewardship to monopolize the public sector market. The irony of course is that the one constant presence during both events, was none other than Rick Grimm. By the way Kelly and Colin – and anyone else who would like to offer their thoughts . . . how should NIGP members respond to this news?